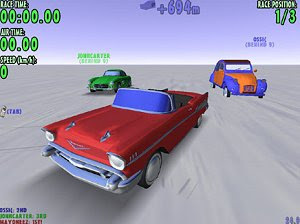 Imagine a snowboarding game with a twist: the snowboarders have been replaced with high performance cars. Imagine three game modes you can choose from: speedrace, slalom and airtime. Imagine 7 high quality cars with realistic looks and handling you can choose from. Imagine dozens of exotic locations around the world you can race on. Imagine you can compete against your own best time or against live human players over a LAN or internet with the built-in multiplay option. Then check the hall of fame to see whether you are better than the legendary PAKOON drivers from around the world. Imagine you can do all this without having to pay anything. You can keep dreaming, or just go ahead and download the new PAKOON! game from Metal Oxide Software.